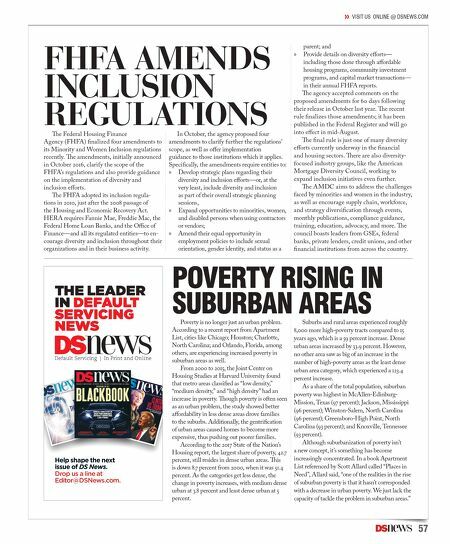 57 » VISIT US ONLINE @ DSNEWS.COM POVERTY RISING IN SUBURBAN AREAS Poverty is no longer just an urban problem. According to a recent report from Apartment List, cities like Chicago; Houston; Charlotte, North Carolina; and Orlando, Florida, among others, are experiencing increased poverty in suburban areas as well. From 2000 to 2015, the Joint Center on Housing Studies at Harvard University found that metro areas classified as "low density," "medium density," and "high density" had an increase in poverty. ough poverty is often seen as an urban problem, the study showed better affordability in less dense areas drove families to the suburbs. Additionally, the gentrification of urban areas caused homes to become more expensive, thus pushing out poorer families. According to the 2017 State of the Nation's Housing report, the largest share of poverty, 42.7 percent, still resides in dense urban areas. is is down 8.7 percent from 2000, when it was 51.4 percent. As the categories get less dense, the change in poverty increases, with medium dense urban at 3.8 percent and least dense urban at 5 percent. Suburbs and rural areas experienced roughly 8,000 more high-poverty tracts compared to 15 years ago, which is a 59 percent increase. Dense urban areas increased by 33.9 percent. However, no other area saw as big of an increase in the number of high-poverty areas as the least dense urban area category, which experienced a 123.4 percent increase. As a share of the total population, suburban poverty was highest in McAllen-Edinburg- Mission, Texas (97 percent); Jackson, Mississippi (96 percent); Winston-Salem, North Carolina (96 percent); Greensboro-High Point, North Carolina (93 percent); and Knoxville, Tennessee (93 percent). Although suburbanization of poverty isn't a new concept, it's something has become increasingly concentrated. In a book Apartment List referenced by Scott Allard called "Places in Need", Allard said, "one of the realities in the rise of suburban poverty is that it hasn't corresponded with a decrease in urban poverty. We just lack the capacity of tackle the problem in suburban areas." FHFA AMENDS INCLUSION REGULATIONS e Federal Housing Finance Agency (FHFA) finalized four amendments to its Minority and Women Inclusion regulations recently. e amendments, initially announced in October 2016, clarify the scope of the FHFA's regulations and also provide guidance on the implementation of diversity and inclusion efforts. e FHFA adopted its inclusion regula- tions in 2010, just after the 2008 passage of the Housing and Economic Recovery Act. HERA requires Fannie Mae, Freddie Mac, the Federal Home Loan Banks, and the Office of Finance—and all its regulated entities—to en- courage diversity and inclusion throughout their organizations and in their business activity. In October, the agency proposed four amendments to clarify further the regulations' scope, as well as offer implementation guidance to those institutions which it applies. Specifically, the amendments require entities to: » Develop strategic plans regarding their diversity and inclusion efforts—or, at the very least, include diversity and inclusion as part of their overall strategic planning sessions, » Expand opportunities to minorities, women, and disabled persons when using contractors or vendors; » Amend their equal opportunity in employment policies to include sexual orientation, gender identity, and status as a parent; and » Provide details on diversity efforts— including those done through affordable housing programs, community investment programs, and capital market transactions— in their annual FHFA reports. e agency accepted comments on the proposed amendments for 60 days following their release in October last year. e recent rule finalizes those amendments; it has been published in the Federal Register and will go into effect in mid-August. e final rule is just one of many diversity efforts currently underway in the financial and housing sectors. ere are also diversity- focused industry groups, like the American Mortgage Diversity Council, working to expand inclusion initiatives even further. e AMDC aims to address the challenges faced by minorities and women in the industry, as well as encourage supply chain, workforce, and strategy diversification through events, monthly publications, compliance guidance, training, education, advocacy, and more. e council boasts leaders from GSEs, federal banks, private lenders, credit unions, and other financial institutions from across the country. THE LEADER IN DEFAULT SERVICING NEWS Help shape the next issue of DS News. Drop us a line at Editor@DSNews.com.